Les Eason, Lou Adams and Billy Meadows, who were prolific goalscorers for the club during the late 1960’s and early 1970’s, will all state that their job was made simple because of the midfield skills of Barry King and Gerry Ward, but more importantly by the service and wing play of Colin Powell. The press viewed Colin as the ‘George Best of non-league football’. Powell is an all time favourite of many Bees fans, was without doubt one of the most exciting players to play for our club, was voted by the Barnet Football Club Supporters Association as 1970’s Player Of The Decade. Colin was born in July 1948 in Hendon but soon moved to Stevenage with his parents. He began as a midfielder in the Stevenage Youth team but ended up out on the right wing and used his greatest asset which was pace. He soon progressed into what was then the Stevenage Town first team at 17. The club unfortunately went into liquidation and Paddy, cleaning windows by day, joined Cambridge City. Paddy takes up the story “Dexter Adams rang and said 'come and meet me for a chat'. I will always remember it because I had no idea what Dexter looked like. I walked out of Potters Bar station and glanced around the forecourt and the only person I could see was a small man in glasses, wearing a cravat and a trilby hat – that can’t be him surely? But it was! ‘Would I sign for Barnet?’ I went home and spoke to my parents and they all convinced me to join not only because it was a big big club in the Southern League with some top players it was also close to home. I was 19!". Dexter saw Paddy as perfect in the role that Peter Anderson had fulfilled the previous seasonespecially as Meadows had also signed that Summer and joined Eason and Roger Figg as strikers. Paddy freely reminisced about those halcyon days; “There were some great players at Underhill when I arrived in 1968 and a bonus was the pitch condition which was superb, the best in the league”. Not only did Paddy terrorise full backs with his pace and trickery he also scored more than his fair share of goals. “We all wanted to score for that team and a player who was superb in front of goal was Lou Adams and we became particularly close friends. Gerry Ward was the truly class player in that team, it was a real privilege to play with him.” Paddy’s record of fitness was second to none. “I hardly missed a game in my whole career and was lucky with injuries” he said proudly. To illustrate this Paddy played in over 300 games for the Bees in just five seasons scoring 84 goals. 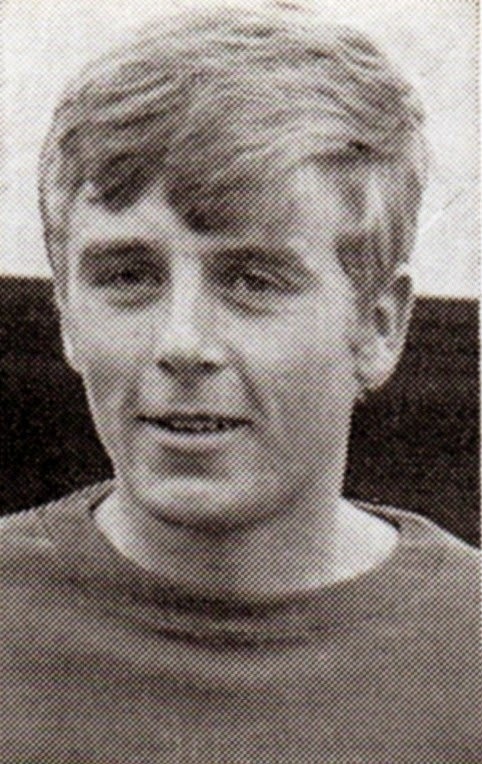 Paddy's debut was 10th August 1968 in a Southern League Premier 3-2 away win over Wellington Town in the following line up: Goymer - Lye, Thompson, Ward, Embery, King, Powell, Stevens, Figg, Eason and Turley. Paddy’s greatest hour in an amber and black shirt was during January 1973 and the FA Cup ties against QPR. Believe me that Phil Parkes’ crossbar was shaking for a week courtesy of a Powell screamer in the last minutes which would have won the day for the Bees. “I thought we completely outplayed them in the replay until the last 20 minutes when the fitness told”. 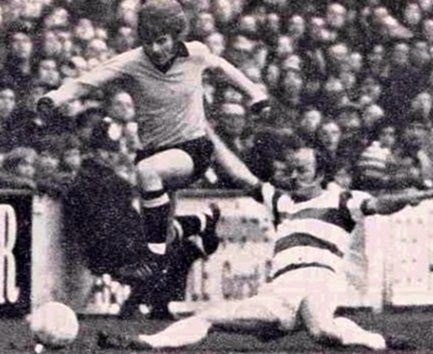 The game at Underhill finished 0-3 in front of nearly 11,000 and the QPR team included the likes of Stan Bowles, Gerry Francis and Don Givens, it was a glorious night all the same. Old time supporters like me also remember his FA Trophy hatrick in a 4-3 win at Bath City when 0-3 down at half time in January 1970. It still sends shivers down my spine when I recall that day. After the aforementioned QPR replay Theo Foley and Les Gore at Charlton Athletic approached Colin and offered him his first full time contract and Barnet allegedly £10,000, Paddy was 24. “Eventually I gave in and chose Charlton not only because the size and potential of the club (they were in the old Division 3 in 1973) but also the close proximity. I knew as did Barnet manager Tommy Coleman that the time was right to move on”. Every Barnet follower was saddened to see Paddy leave Underhill, with his mop of thick blond hair on the right wing leaving full backs for dead time and time again, but we all knew he would progress. He was an exceptional talent and we had been fortunate to witness his maturity. He never let the side down and was one of those players who would give the crowd an instant lift of expectancy when he received the ball. I honestly believe only Andy Clarke and Dougie Freedman have come close to Paddy’s ability to excite an Underhill crowd in that way. “I spent five brilliant seasons at Charlton, again hardly missing a game.” He continued “I was approached by Derby County in 1977 about the same time that my mate Derek Hales moved there, Colin Murphy put a bid in for me but Charlton rejected it. I also spoke to Sheffield Utd too. I then briefly moved to America, to Boston Massachusetts playing for the New England Tea Men with my Charlton team mate Mike Flanagan. They forked out £90,000 for me! After a season there I returned to the Valley until 1981 partly because I was also offered one of the houses that Charlton owned to live in, so that was a big bonus”. The rumour around that time was that Barry Fry had tried to sign Paddy for Barnet but Paddy denied this “No he didn’t although we did speak a lot on the phone at the time”. I also challenged him that he applied for the position of manager when Fry was sacked before moving to Maidstone. “No to that again, but I did think about it for sure, that is probably how the rumour started but no I didn’t actually apply” he laughed. “At 40 I was fortunate to get a job at Westminster School in London coaching football and also tending to the pitches. That was in my blood because as a nipper at Stevenage I would lend a hand with the pitch maintenance and also helped at my local cricket club too nursing the wickets. Roger Alwyn, the Charlton Chairman found out what I was up too and offered me work looking after their training pitches. Frankly the lure of the place was impossible to turn down and of course the club ultimately returned to the Valley after ground sharing at Selhurst Park and Upton Park. I eventually became head groundsman at the new stadium, it was perfect. I was part of Charlton for 40 years.” Paddy retired in 2014. Charlton presented Colin with a testimonial in July 2013 in the form of a pre season friendly with Inverness Caledonian Thistle. “I felt very proud walking out to a guard of honour by the players” he said. I asked him what is in the future. “I desperately want Charlton to return to the top flight, because when you have sampled Premiership football you really don’t want anything else. However I will put today’s football into perspective - when l left Barnet and joined Charlton in 1973 I was earning £40 a week – I would have had to have played for 100 years to earn what Rooney earns in a week!” Paddy Powell would certainly be a millionaire if he played today, he is a Legend of Barnet FC and it always a sheer pleasure to talk with him. Paddy and Richard Soer - just for you Rich!